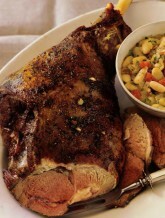 Roast leg of lamb is the French cook’s pride, paraded for guests, or a birthday, or for family Sunday lunch. To make the most of this expensive cut, a gigot is invariably cooked on the bone, with a clove of garlic tucked into the shank so it permeates the whole roast. The meat may be spiked with more garlic and herbs, and is basted with butter to ensure a golden finish and tasty gravy. However, accompaniments vary from region to region. In the south, boulangère treatment is popular, where the leg is roasted on a bed of sliced onion, potatoes and herbs so they end brown and succulent with meat juices. When we lived on the northern coast in Normandy, our friend Françoise would roast piquant lamb from the salt marshes (prés salés) with little onions and baby potatoes, serving it with green beans from the garden. Along the coast in Brittany, white kidney beans simmered with a bit of tomato are customary, always with plenty of garlic. Dried white haricot beans are used for this bretonne garnish, and in the United States, great northern, navy or pea beans can take their place. The beans can be cooked up to 3 days ahead and reheated on top of the stove, but the lamb itself is best roasted only just before serving. To cook the beans, soak them overnight in cold water. Drain and put them in a large saucepan with the clove-studded onion, bouquet garni, and enough water to cover by at least 1 inch/2.5 centimeters. Cover, bring to a boil, and simmer until the beans are very tender, 1 to 3 hours depending on the type of beans. Add more hot water as it is absorbed to keep the beans covered in liquid, and season them with salt and pepper halfway through cooking. At the end of cooking, they should be moist but not soupy. If they are sloppy, remove the lid 15 to 30 minutes before the end of cooking so liquid evaporates. Discard the onion and bouquet garni. While the beans are simmering, cook the tomatoes. Melt the butter in the sauté pan and sauté the onions over medium heat until soft but not browned, 5 to 7 minutes. Stir in the tomatoes, garlic, white wine, salt and pepper. Simmer over medium heat, stirring often, until nearly all the moisture has evaporated, 15 to 20 minutes. Stir the tomatoes into the cooked beans, taste and adjust the seasoning. To roast the lamb, heat the oven to 450˚F/230˚C/Gas 8. Prepare the lamb by trimming off any skin and all but a thin layer of fat. Cut one garlic clove in sticks and push the other into the lamb shank. Poke holes in the meat with the point of a small knife and insert sticks of garlic with small sprigs of thyme. Set the leg in the roasting pan, dot it with butter and sprinkle with salt and pepper. Sear the meat in the very hot oven until it starts to brown, 15 to 20 minutes. Lower the heat to 375˚F/190˚C/Gas 5 and continue roasting, basting often, 40 to 50 minutes, more if you prefer your lamb well done. Test by inserting a skewer in the thickest part of the meat; for pink lamb it should be warm to the touch when withdrawn, or hot if you prefer it well done. A meat thermometer should register 140˚F/60˚C for pink meat, or 160˚F/70˚C for well done. If the pan juices start to scorch during roasting, add a little broth. Transfer the lamb to a carving board, cover it loosely with aluminum foil and leave it to stand while making the gravy. Discard the onion and bouquet garni from the beans and if necessary, reheat them on top of the stove. Stir in the parsley. For gravy, discard all but a tablespoon of fat from the roasting pan. Add the wine and heat it, stirring to dissolve the juices. Add the broth and boil until the gravy is reduced and concentrated, 5 to 8 minutes. Strain it into a small saucepan, taste, and adjust seasoning. For serving, carve the lamb in thin slices and replace them on the bone, or carve the meat at the table if you prefer. Place the leg on a large platter, spoon the beans around it, and decorate the platter with watercress. Spoon a little gravy over the meat and serve the rest separately.